It is possible that the surgical strikes might be delayed by a week to allow Britain’s participation. The British Parliament wants to hold back authorization until the UN inspectors present their report on the atrocity. There is, of course, no need for British help in the military dimension. Politically, British participation endows more legitimacy to what is effectively a unilateral US police action. Which brings us to why the US has decided to intervene in the first place. Apologists would claim that this is a humanitarian intervention. It isn’t. 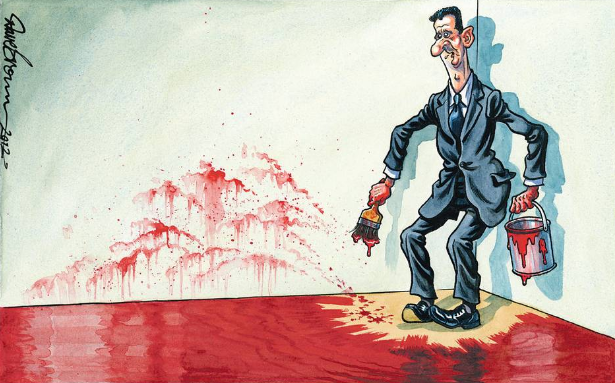 The White House has decided to punish Assad purely in order to restore US credibility. Some realists have claimed that the strikes are intended to deter Assad from using chemical weapons again. Yet, the United States has no conceivable raison d’état to deter Assad from using chemical weapons again. The US could well want to see Assad out but this is not what these realists are saying. In fact, their claim is that the US has no vital interest at stake in Syria, certainly not enough to justify kinetic action. The Economist reckons that US credibility is at stake. “Even the most cautious American leaders will saddle up and play sheriff if the alternative is a world in which, when America has clearly announced that it will defend an international norm, a rogue dictator thinks he can call its bluff.” In other words, if Obama wanted to stay out he shouldn’t have issued red lines a year ago. Assad crossed the line multiple times since then but Obama backed off, saying that a “large-scale use” of chemical weapons would change his calculus. Assad used the one year anniversary of Obama’s ‘red line’ speech to launch a truly massive attack; at a site close to UN inspectors to boot. Such blatant disobedience will not be tolerated by the self-appointed global policemen. This is not a matter of ‘US interests’, ‘responsibility to protect’, or even ‘international norms’ against the use of chemical weapons. This is about managing the US-dominated international order. Simply put: in order to manage a string of subordinate states and regulate inter-state relations, it is much more effective for the dominant state to follow a policy of severely punishing insubordination even when it has no vital interest at stake. This deters other subordinate states from challenging the authority of the dominant state and thereby reduces the cost of running the international system. The point is that sovereignty is shaped from below, by those who are afraid. There are about 200 states in the world with varying degrees of sovereignty. The vast majority of them are in long-standing hierarchical relationships with powerful neighbors or far-away great powers. The smaller Arab Gulf states are under Saudi protection. The Central American states have been US tutelage for at least a century. Even today Britain has a string of dependencies strewn across the globe. Not only are small states not really ‘sovereign,’ even great powers can be found in varying degrees of subordination to more powerful states. Both Germany and Japan – the latter more so than the former – do not have an independent foreign security policy, which they ceded to the United States at the end of the last hegemonic war. Even the United Kingdom is in a strongly asymmetric relationship with the boss. This is nonsense. The first goal of any state is to ensure its long-term survival. Faced with a powerful state, it can either balance against it by forging coalitions with other states, or it can bandwagon with it. When a weak state bandwagons with a much more powerful state, it necessarily has to subordinate itself to it and concede decision-making authority, especially in the security sphere. This is precisely how spheres of influence form. Since small states are basically defenseless against their powerful neighbors – and their proximity is more or less permanent – they will eventually have to submit whether they like it or not. One should therefore not be surprised to find most states are either protectorates, dependencies, or in another state’s sphere of influence. What Lake does show quite convincingly is how authority is reinforced in the international arena. The dominant state may at times need to punish the subordinate state to impose order. Moreover, the dominant state may find that it pays to go beyond what is strictly required to restore the status quo, because of the demonstration effect which deters other subordinates from challenging it. It is only in this light that the US’ hyper-vindictive ongoing economic war against Cuba appears anything but totally out of whack. But you say: ‘surely, Syria has never been a subordinate of the United States.’ True, Syria has been Russia’s client for most of the post-war era. The United States is not just the most powerful state in the system. It is also the guardian of the international order that was forged by the winners of the last hegemonic war. On an interesting side note, during 1943-44, ‘United Nations’ was a label for the three superpowers who were soon to win: the Soviet Union, Great Britain, and the United States. Britain fell from the ranks of the superpowers shortly after – Kissinger dates it in 1957 and we would be wise to not argue with him on such matters – and the Soviet Union struggled on for another three decades. It looks like the days of superpowers are numbered. This is exactly Barry Buzan’s recent argument in the inaugural Kenneth N. Waltz Annual Lecture. In Buzan’s view, the notion of a superpower is a social construct. In order to qualify as a superpower, it is not enough to have the full range of coercive capabilities including the ability to project significant amount of power anywhere on the globe, he argues, the state also much enjoy ‘international legitimacy’ for large-scale politico-military actions. In other words, it must enjoy consent from other states to exercise superpower functions. These ‘superpower functions’ are nothing other the activities we have so far identified with a global policeman. In his view, the days of the last superpower are numbered, and what is about to emerge is a more regionalized world order. ‘Decentered globalism’ is a world where capitalism is universally accepted, much of the world is industrialized, and global power is diffuse. With all due respect Professor Buzan, this is not how global capitalism works. Indeed, centered realism predicts the opposite: a reinforcement of America’s role as a global policeman. In fact, a world characterized by ‘decentered globalism’ will be highly unstable and unlikely to survive for any considerable length of time. The Policy Tensor has a strong affinity for precise language. The upcoming action is neither a humanitarian intervention, nor is it designed to impose the norm against chemical weapons use. It is a police action intended to punish insubordination and thereby restore the authority of the United States as the guardian of the international order. Lake, David A. Hierarchy in International Relations. Cornell University Press, 2009. Print. Buzan, Barry. “A World Order Without Superpowers: Decentered Globalism.” International Relations 25, no. 1 (2011): 3-25.